Despite what you may have heard, email marketing is not dead... and youre going to discover every single step you need to take to effectively adapt to marketing with email and autoresponders. It Takes Any Prospect Youre Targeting An Average Of 7 Times Before They Finally Tune In To Your Sales Message... But It Can Take As Many As 13! But that doesnt mean you have to generate seven times more traffic, or submit your link to seven times the amount of directories... it simply means you have to follow up your prospects at seven more intervals for them to finally tune in and buy from you. ...And Thats One Of The Reasons That Drove You Here In The First Place, Out Of Desperation For More Time, More Money, And Brighter Success! Listen and think about this for just a second. Youre an internet entrepreneur, so focus on one thing and leave the email marketing to a useful tool. 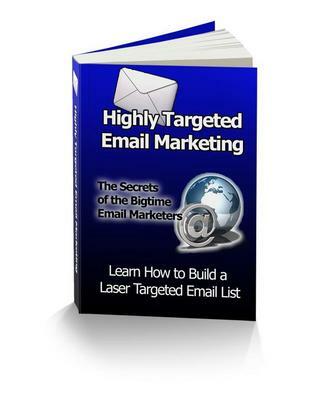 Youre probably new to this whole thing, and thats why I am going to teach you the ins and outs of everything you will ever need to know to take advantage of making a killing with email marketing, and tell you everything you must know to make a killing with email in this new year.